Most people often think that money is created by reserve bank. But this is partially true. Today the money which we are using is electronic money. And this money will be created by Banks just out of thin air. To understand how money will be created we have to go through a concept called "Fractional reserve banking system"
Assume in an economy only one Bank exists. Assume a person came and deposited $1000. With their experience Banks know that only 10% of their deposits will be withdrawn by their depositors for basic money requirements. Remaining money will be there in the bank itself. So they keep 10% of these money as reserve for occasional demands and lend 90% these money for a person who needs money. 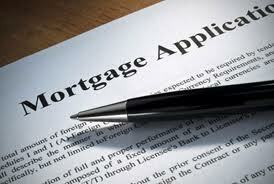 This loan is based simply on the "promissory" note written by the loan taker. So money will be lent based on the borrower capacity to pay. So the people of this Banking example have a total of Rs.10,000 as deposits but only Rs.1000 is in the form of physical money. The remaining money Rs.9000 exists only on books or electronically. It is simply created out of thin air. Now we look at the main concept, How banks will get money? 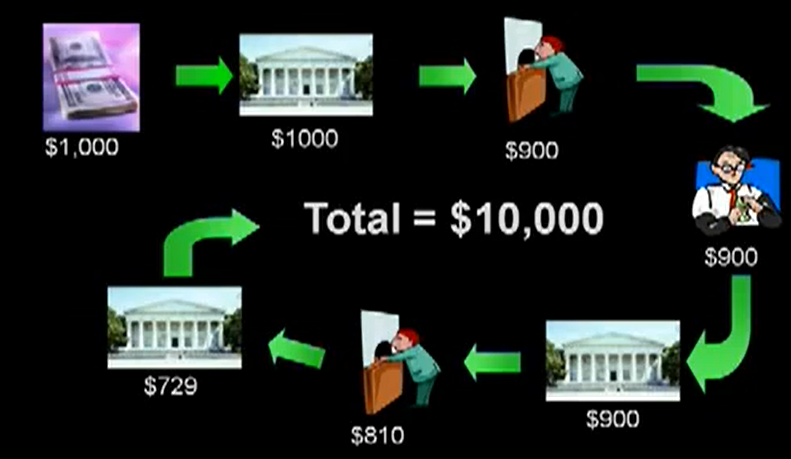 When government needs money, It borrows money from Federal Reserve. Now Government creates a simple form called "Government Bond" or "Government Security" or simply G-sec for the money it wants and sends it across to Federal reserve. Now federal reserve simply prints money and takes government bonds in exchange. i.e., Government is borrowing money from Federal reserve. So this money is being deposited in the banks by the government in the process of making payments. 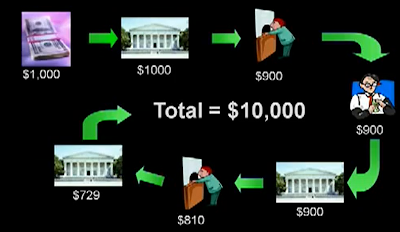 The banks give loans according to the Federal requirements. So in an economy Money is not just the physical money or Narrow money (M0) we use. But the Broad money M3 is what considered as money. It is created by the local banks subjected to some rules set forth by the federal reserve. In an economy all the people who borrowed pay their debts, money simply disappears. If the bank also gives the initial deposit of Rs.1000 to the depositor there is no money in the economy. So in modern banking Money = Debt. As of now we are not considering the important concept of interest. And also one important question still remains to be answered. What if any person who takes a loan may not able to pay it back? We address this important question in the next article. Watch this video for further understanding!